But the inner paparazzi comes out in many of us especially at the White House. 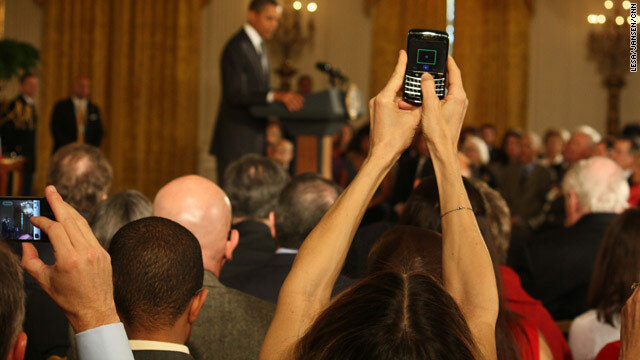 Here is Sarah Jessica Parker, often the object of paparazzi, snapping away as President Obama speaks in the East Room at the White House Monday. CNN – keeping up with your high standards I see. WTF is this? Maybe an article on the "fake budget" would have been a good thing? You know, the BO budget that the dems don't even want to support? What are these clowns doing? The leadership proposes a budget that he knows nobody will vote for and the leader of the Senate says "we aren't going to take a vote on it". How can anyone support this administration? When the only record you have to run on is really bad, you have to resort to shallow popular items, like this one, to run on. First Lady Michelle Obama ROCKS! She will be known as one of the best of all time. You trolls need to get a life. You are pathetic.